The director of a Christian organisation organises seminar that brought together some 40 leading Christians, Muslims and Hindus. Grateful for the opportunity to take part in the event, one Muslim scholar acknowledges that Pakistani Christians "love the country" and play an important role in "education and health care." Another Muslim leader says he found inspiration in the teachings and practices of Jesus. Multan (AsiaNews) - More than 40 people, including several prominent Muslims, took part in a seminar on the 'Concept of God in Christianity'. The purpose of the gathering was to improve understanding of Christian traditions and promote tangible ways to build "bridges of peace" between Pakistan's Muslim and Christian communities. Participant received a copy of the Bible as a gift. 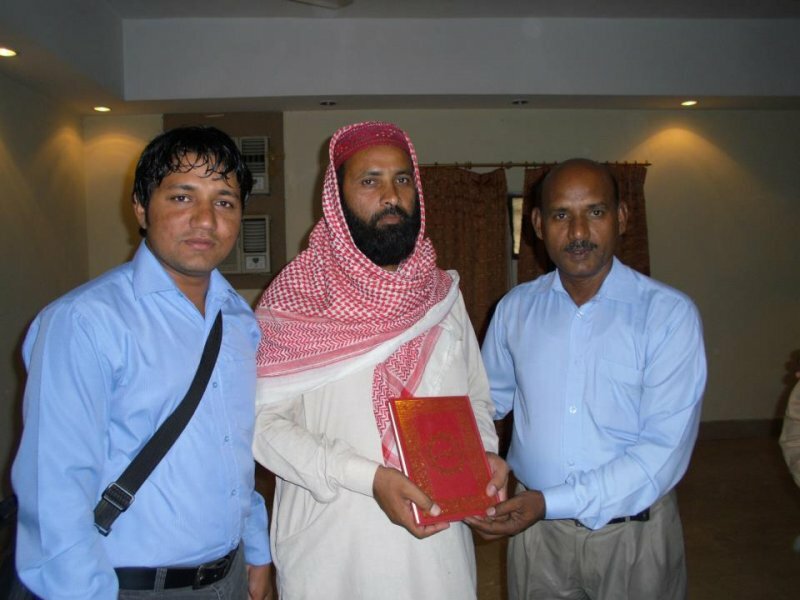 Held in Multan (Punjab) on 12-15 June, the three-day initiative came from Asher William, director of a Christian organisation, Pakistan Outreach, that promotes interreligious dialogue, social harmony and the word of God. "It was a wonderful, historical and a landmark day in my life," Williams told AsiaNews. It is "difficult to explain my feelings in words, the joyfulness of the moment when I gave 15 copies of the Holy Bible to Muslim clerics and individuals. I praise the Lord for this extraordinary blessing. I will never forget this day." Titled 'Promoting Social Harmony and Peace,' the seminar brought together Christians, Muslims and Hindus. For Williams, the goal was that of building bridges between communities and contributing to the birth of a society "based on equality and non-violence, free from discriminations." Two prominent Muslims, Al-Haaj Tahir Abas Naqvi and Ejaz Mehmood, took part in the event. Both received a copy of the Bible (pictured). "Holding the Holy Bible in my hands was an amazing experience and a memorable day in my life," said Naqvi, a Muslim cleric and Islamic scholar honoured with the title of al-Haaj bestowed upon those who have made the pilgrimage (the Haaj) to Makkah, a city he has already visited twice. "I will definitely read it and ask for blessings for my family". Naqvi acknowledged that in the past he held inaccurate ideas about Christians in Pakistan. "I thought they were against Islam and Pakistan," he told AsiaNews. However, "I met friendly, loving and committed citizens," especially in the fields of education and health care. Similarly, Ejaz Mehmood, an Islamic religious scholar, urged Pakistan's "two main communities," Muslims and Christians, to "live in peace." He blames the government for introducing rules and laws that he defines as discriminatory against religious minorities, and the cause of many problems that exist today in Pakistani society. For Mehmood, learning about the "Concept of God in Christianity," which was the topic of the seminar, "was a significant experience because of the parallels between the Bible and the Qur'an." The meeting was also useful because it changed his perceptions about Christians and gave him an opportunity to find inspiration in "the teachings and practices of Jesus."